Not the drug kind of hit. No my 10,000 blog hit, it happened sometime during the night like Father Christmas coming or foxes eating your boots (it happens). I have amazingly reached the grand old age of 10,000 and in all honestly I cannot believe it. I didn’t for one moment 6 weeks ago when I first started blogging away that anyone would read my random ramblings, let along in the colossal numbers that it has, it’s really extraordinary. All my life I never thought of myself as a writer, at school teachers were always telling me how bad I was at any sort of writing. So to reach five figures today is a big two fingers up at my demoralising teachers. So why did I start to write? In all honesty because of a two tiered unenthralling motivation. Firstly, boredom, that’s right not inspiration coming to me in a dream or God willing it, pure unadulterated boredom. It was my way of filling the nights when I couldn’t sleep or to escape from my solitude living. The second is my constant driving force through life; to make people smile. Anyone who knows me will readily admit that making people laugh is what motivates me. I’ve tried many other methods to make people chuckle: drama (too scripted), improv theatre (too unscripted), music (if you’ve heard me sing you’ll know why that failed) and finally I ascertained that putting pen to paper (or finger to key) created the perfect outlet. It allows me to witter away the hours by wittering away. 10,000 is a huge milestone and I hope to high heaven that I can add another 0 onto that number in the distant future but for now I am more than happy making people all around the world laugh virtually. That feeling is by far the best feeling in the world, even better than watching a slinky race down some stairs. So keep reading my scribbles on life as there are barrels more of it rattling around in my head. James its amazing how you come across as someone who’s philosophy is akin to mine (even if I am old enough to be your Granny!) I too like and love to make other people laugh, I used to always be the clown where I worked and it was the highlight of the day if I had everyone in stitches. I very nearly got my O levels in English, just missed out. I love writing, therefore having a blog is an obvious answer to that. I try to make others laugh in my posts, although sometimes I don’t always find that easy to do. The funniest incidents come from watching and observing other people around you and also the sights that you see. We also both seem to enjoy having a moan and rant about stuff as well (although when you get to my age it seems to be all you do all day is rant about stuff!) Well done and here’s to your next 10.000 James. Bottoms up! Every now and again Richard I leave things in for you to find, thats my excuse anyway and I’m sticking to it. This has been a so interesting read, would love to read more here…. hey great James, congrats for the 10,000th hit. 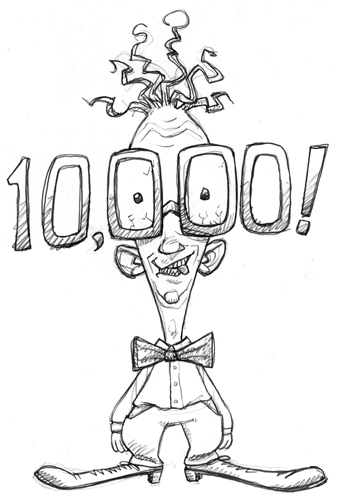 Indeed, well done and to many more milestones, want to guess when 1 million turns up? haha I think I will be old and grey before the million mark happens!